Gymnopus fusipes is the type species of the genus Gymnopus. 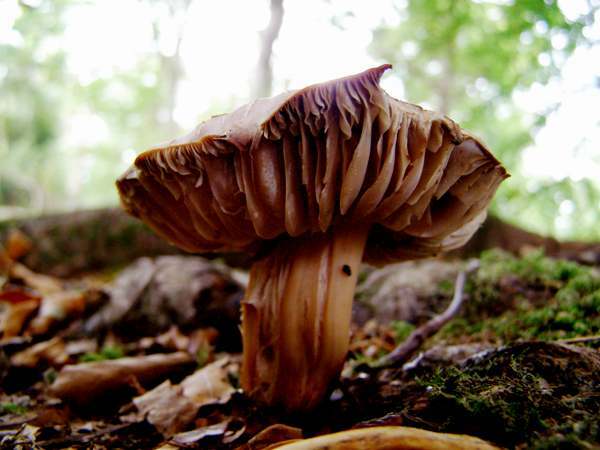 Infection by the mycelium, of this woodland mushroom is the cause of a root rot in oak trees, mainly Pedunculate Oak Quercus robur, and Northern Red Oak, Quercus rubra. Apart from seeing the fungal fruitbodies in autumn, evidence of the disease is often visible in the form of a deterioration of the crown of affected trees, although this is not always the case. Fast-growing healthy trees seem able to cope better with attack by this fungus than slower-growing trees that are already struggling to survive. Soil humidity seems to be a critical factor in the incidence of this type of root rot, as Gymnopus fusipes tends to show a marked preference for moderately dry to very dry or sandy soil rather than waterlogged soil. 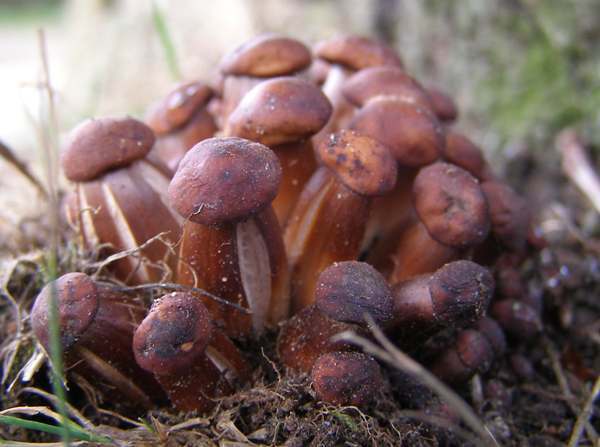 When young Spindleshanks mushrooms first appear at the base of a tree, they look like a fistful of fat copper nails. In the group shown on the left, seen in southern Portugal, dry weather has caused the tubby stems to split lengthways. Recurring on or beside the basal roots of oak trees and occasionally Beeches, Gymnopus fusipes occurs in woodland and parkland throughout Britain and Ireland; it is also found on the European mainland, where it is particularly common in warm dry central and southern countries, and in many parts of Asia. In the USA and Canada this fungus is considered an invasive species and a serious pest, as it does a great deal of damage to Quercus rubra, the Northern Red Oak, which is reported to be much more susceptible to Spindleshank root rot than the European oaks are. 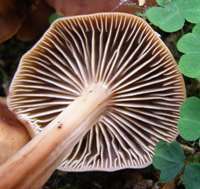 The basionym of this species dates from 1791, when French mycologist Jean Baptiste Francois (Pierre) Bulliard described Spindleshanks and gave them the scientific name Agaricus fusipes. (In those early days of fungus taxonomy, most of the gilled mushrooms were included initially in the genus Agaricus!) It was the British mycologist Samuel Frederick Gray (1766 - 1828) who in 1821 transferred this mushroom to the genus Gymnopus, thereby creating the binomial name Gymnopus fusipes by which Spindleshank is generally accepted today. 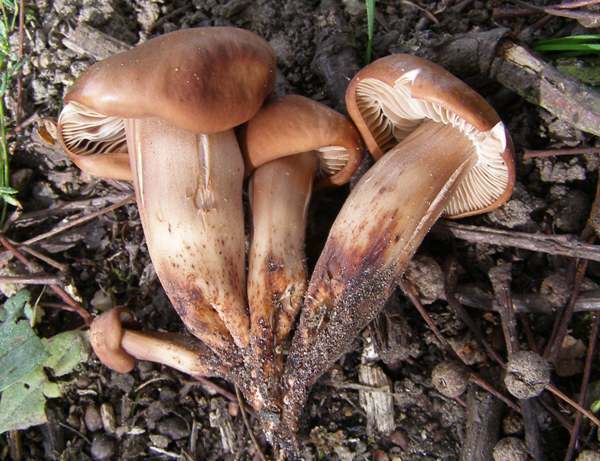 Until quite recently most field guides referred to Spindleshanks by the scientific name Collybia fusipes, a name given to this species by Lucien Quelet in 1872, and many authoritative online sources do not yet reflect the recent redistribution of many former Collybia species to other genera such as Gymnopus and Rhodocollybia. 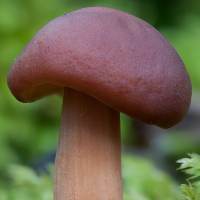 Gymnopus, the generic name, comes from Gymn- meaning naked or bare, and -pus meaning foot (or, in the case of a mushroom, stem). 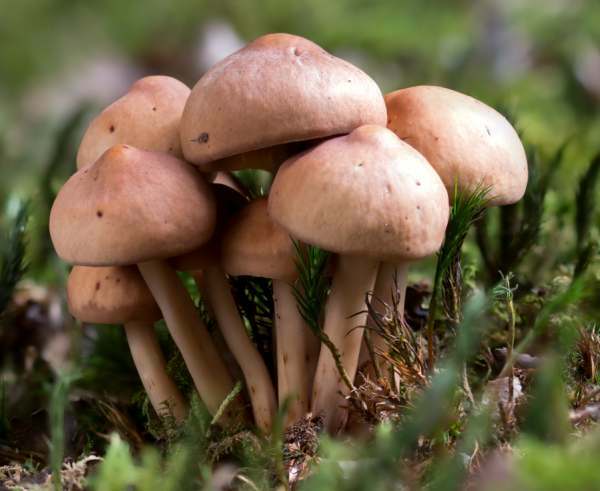 The specific epithet fusipes means ' with spindle-shaped stems', and indeed most often the stems are centrally swollen and taper sharply towards the base - particularly so when, as is most often the case, these mushrooms occur in tufts rather than singly. 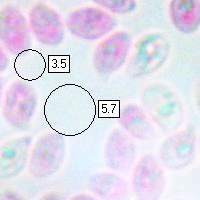 Convex, flattening with an irregular incurved margin at least until fully mature; 3 to 7cm across; brown, often with dark brown blotches. White, tinged tan-brown, developing rusty spots; adnexed or free; very widely spaced. White near the apex, tan towards the base; spindle-shaped and usually grooved and sometimes lined longitudinally; 7 to 15cm long and 0.8 to 1.5cm diameter; no stem ring. 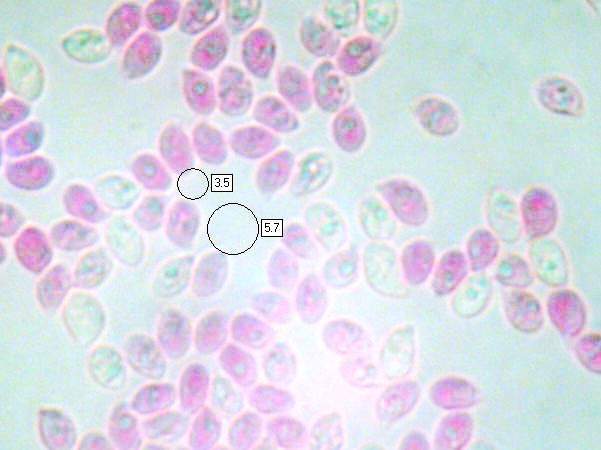 Ellipsoidal to pip-shaped, smooth, thin-walled, 4-6 x 2-3μm; hyaline. Parasitic/saprobic on the basal roots of mainly hardwood trees, especially oaks and less commonly Beech. July to October in Britain and Ireland; several weeks later in southern Europe. The distinctive shape of the stem makes it almost impossible to confuse this species with any of the other common woodland mushrooms. 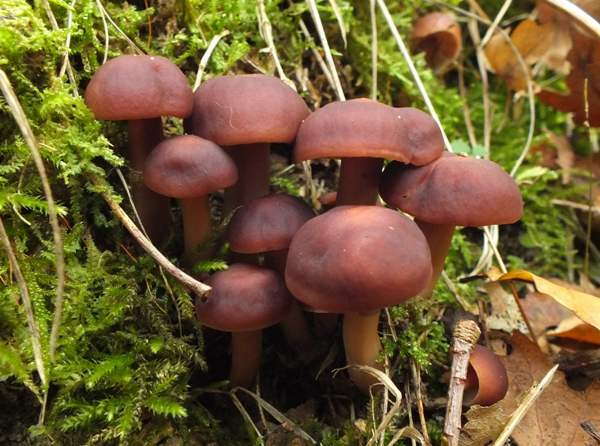 Gymnopus fusipes is recorded as 'edible but not worthwhile' in some field guides, but in any case these mushrooms are too tough to be tempting and are therefore not worth considering as a culinary collectible.